A Great Mid-End Entry Level Gaming PC capable of running the latest titles at mid to high settings with good frame-rates. The ultimate combination of performance and value – ADMI ULTRA series Gaming PC’s utilise specially selected components to provide unrivalled experience in both gaming and general computing environments. The 2 cores of raw Intel CPU Power in this PC, working in tandem with the full 8GB of rapid 2133MHz DDR4 RAM, ensure top-end performance at all times across all applications. Enjoy agile multitasking and exhilarating media operations straight out of the box – connect a wide range of HDMI displays for crisp, high definition audio and video and experience the near-instant transfer speeds of USB 3.0 for all your devices and peripherals. Turbocharge your gaming experience with the GeForce GTX 1050. It’s powered by first-generation NVIDIA Pascal architecture, delivering twice the performance of previous generation cards at half the power consumption. For serious gamers, this means you get all the horsepower you need to play the hottest titles in beautiful 1080 HD resolution and at high settings. All ADMI PC’s are assembled and benchmark tested to the highest levels, with future-proofing, reliability and unrivalled performance being our baseline standard. 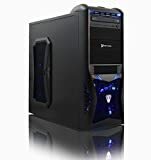 This entry was posted in Computer Desktops and tagged 1050, 1080p, 3.5GHz, ADMI, Blue, Card, Case, Computer, Core, DDR4, DDR5, Desktop, Drive, Dual, Family, G4560, Gaming, GeForce, Graphics, Hard, HDMI, High, Home, Intel, Memory, Multimedia, Operating, Pentium, Platinum, Powerful, Spec, System, ULTRA, Vantage, Warranty***, WiFi by Express Computer Supplies. Bookmark the permalink.